SIZE: 3 Beds | 3.5 Baths | 3,500 Sq. Ft.
About: One of Soho’s most breathtaking Penthouse provides an opportunity for a refined lifestyle rarely seen. This exquisite one of a kind residence sits discreetly on Thompson Street between Prince and Spring. Each detail has been brilliantly designed by Nico Rensch and Victoria Blau architects, with an integrated modern aesthetic informed by simplicity. The unassuming entrance is the prelude to this dramatic triple height great room showcasing 23 foot ceiling heights, linear Gas Fireplace, custom built in seating, and integrated lighting. At night, this room doubles as a world class home theater. All aspects of the home seamlessly flow into one another through a series of glass walls and movable panels. A one-of-a-kind Zen Garden, with mature Weeping Cherry Tree, serves as the heart of a home - situated in an open-air Light Well, bringing the magic of the changing seasons. SIZE: 4 Bed | 2.5 Bath | 2,500 Sq. Ft.
About: Sleek, dramatic 4 Bedroom, 2 1/2 bath contemporary situated on a quiet cul-de-sac adjacent to reserve with private beach access. Elegant architecture and interior design by one of the Hamptons top designers make this a true find. You'll be "wowed" from the moment you arrive by the home's curb appeal and manicured grounds. No detail has been spared in the just-completed renovations, from the professional kitchen with top-of-the-line appliances; exquisitely-appointed bathrooms; sparkling new windows; interior and exterior doors; state of the art central air system; central vac and other amenities. Stunning views and sunny decks abound to lend a true outdoorsy feel to the entire home. 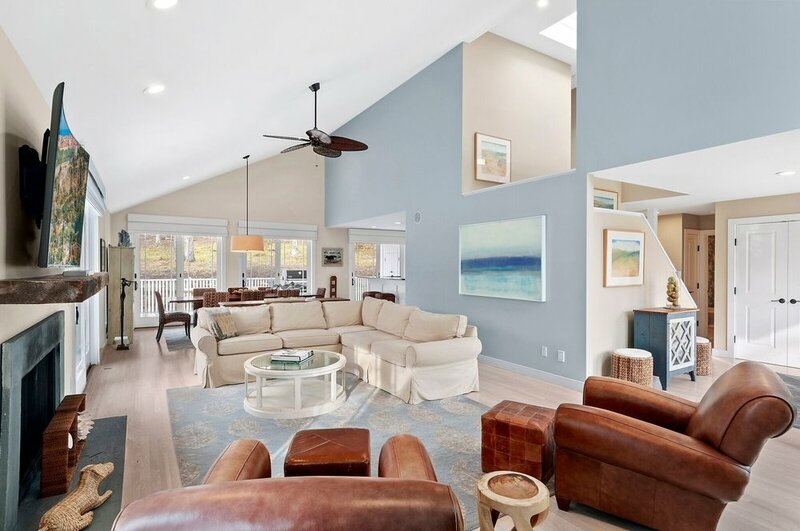 Two wood-burning fireplaces, flat screen TV's, indoor and outdoor sound systems and a 20 x 40 heated salt water pool and hot tub... spacious deck area with top of the line teak furniture create an inviting aerie for relaxing or entertaining. SIZE: 2 Bed | 2 Bath | 1,043 Sq. 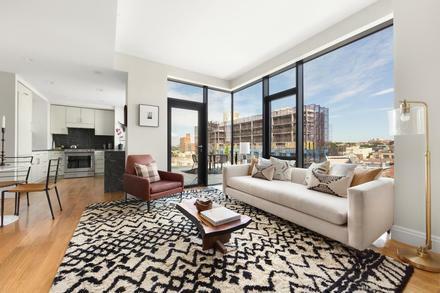 Ft.
About: This incredible split 2 bedroom / 2bathroom residence with northwestern exposures features 10-foot ceilings and a large private terrace off the living room with breathtaking Park Slope and Manhattan views, and an additional en-suite master bedroom terrace. Oversized windows provide copious amounts of natural sunlight throughout, with protected city views of the Hudson River, Statue of Liberty and Empire State building. This expansive residence provides a sizeable living room and privacy through a wide gallery entry. Other features include washer/dryer hookups and abundant closet space. Inside, abundant natural light pours through oversized windows with remarkable views. This spacious unit offers a plethora of unique features and tasteful upgrades, including wide plank white oak hardwood floors, 7-foot red oak interior doors and central heating and cooling. The kitchen exudes the epitome of modern luxury with Grafitti marble countertops and backsplashes, custom cabinetry, Bosch stainless steel appliance package and kitchen island for great flexibility. The bathrooms feature a stunning combination of elegant finishes, including Volakas marble top vanities, deep soaking bathtubs, enclosed steam showers, Toto toilets and polished chrome Aquabrass fixtures. Building features include an outdoor common resident terrace, fitness center, secured package room and bicycle storage. About: Apartment 611 is an impeccably renovated studio in the historic Cast Iron Building. This oversized studio features new wood floors with sound proofing. A remodeled kitchen boasts a marble countertop, full-size stove, microwave, and new cabinets. More marble countertops can be found on the breakfast bar in the entry hallway. Hidden below the bar is a wine fridge. Custom California closet configurations were added to the apartment to allow for more storage space. The gut renovated bathroom was entirely redesigned with new floors and tiled walls, with the addition of a brand new sink, medicine cabinet, toilet, and extra large tub. Wall sconces and ceiling light fixtures are a few more bonuses from the renovation. All electrical lines and outlets were upgraded. The Cast Iron Building is a full service co-op with a 24 hour doorman, porters, and a resident superintendent. The building amenities include a roof deck, laundry room, bike room, and private storage. The co-op is currently in the process of installing a gym. Private storage space for $75/month.